The Kythnos Sifnos ferry route connects Cyclades Islands with Cyclades Islands. Currently there is just the 1 ferry company operating this ferry service, Zante Ferries. The crossing operates up to 5 times each week with sailing durations from around 2 hours 15 minutes. Kythnos Sifnos sailing durations and frequency may vary from season to season so we’d advise doing a live check to get the most up to date information. The Greek island of Sifnos is located in the western end of the Cyclades group of islands and is typical of the islands of the Cyclades with its traditional architecture, lovely calm beaches, pretty tavernas and hills. The island's south coast is where most of its popular beaches are located and many have soft sand, crystal clear water and good facilities. A popular attraction on the island is the lovely Monastery of Chrissopighi which is the island's protector. The most picturesque village on the island is Kastro, which is surrounded on three sides by views of the Aegean Sea, and is characterised by narrow streets, stone built houses and beautiful views of the sea. The village can trace its history back 4,000 years with evidence of its past visible in many places and includes part of its defensive wall which was built in around 800 BC. The island's port is located in the town of Kamares. During the summer months there are daily services of both high speed and conventional ferries to the island. 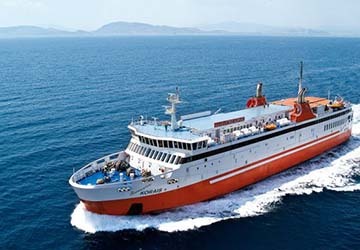 Ferries connect Sifnos with Piraeus and to the other Cycladic islands such as Serifos, Folegandros, Kythnos, Milos, Ios, Santorini and Crete.